Ever wanted your character to pick up a sword – any sword – and make it a "flaming sword"? How about a gunfighter who could pick up any pistol and bypass armor without changing ammo? Now you can! 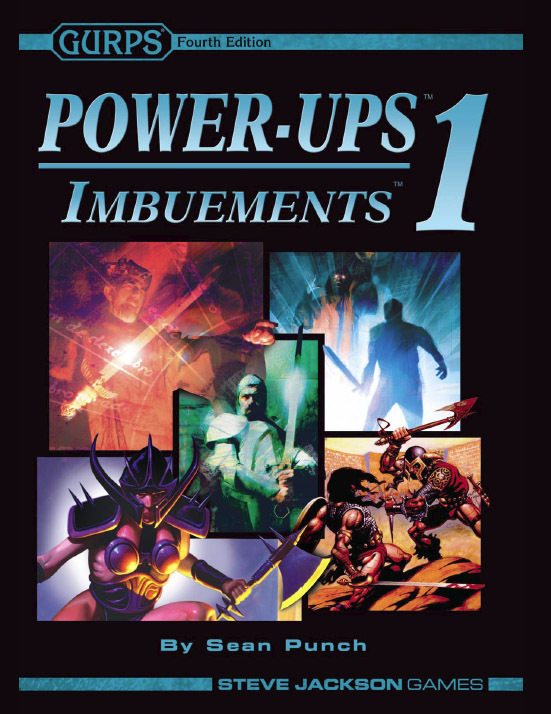 Sean "Dr. Kromm" Punch has written GURPS Power-Ups 1: Imbuements specifically to address this ability. With skills falling somewhere between cinematic combat skills and magic spells, Imbuements allow characters to channel an exotic force – or supernatural ability! – into whatever weapon they have in hand. GURPS Powers – Here's everything you need to create every kind of amazing, off-the-chart superhero you can imagine . . . as well as amazing wizards, wuxia fighters, shamans who command spirits . . . even gods! Check out the entire Power-Ups series! GURPS Martial Arts: Yrth Fighting Styles – On the fantasy world of GURPS Banestorm, the might of GURPS Martial Arts is sometimes enhanced with Imbuements. Pyramid #3/71: Spaceships II – Featuring "Vehicle Imbuements," an expansion that gives your transportation an unexpected edge!